Fight this anti-union campaign on Twitter and on Facebook. AFT is pleased to announce that this year’s AFT 1493 Scholarships have been awarded to Trista Barrantes and John Keller. 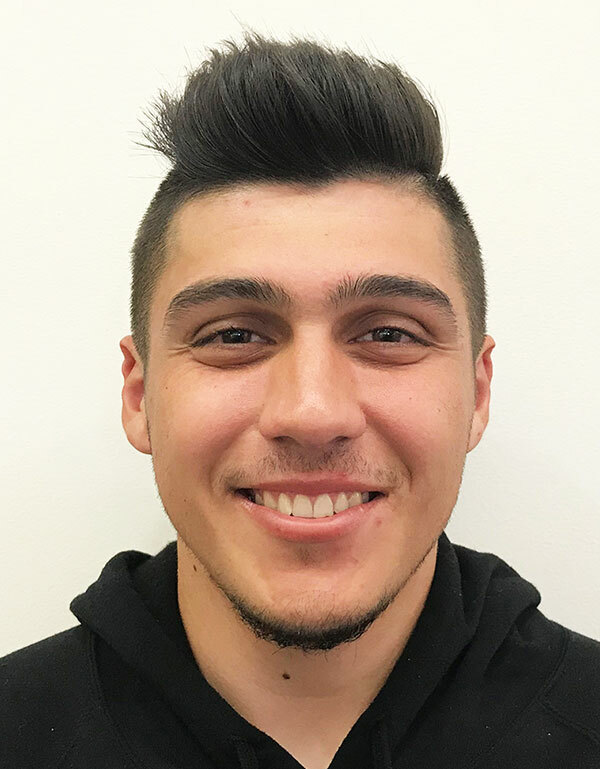 AFT 1493 Scholarships, each in the amount of $1000, are awarded to two SMCCCD students who maintain a minimum GPA of 2.5, who participate in community service activities, and who are committed to social justice issues and concerns. 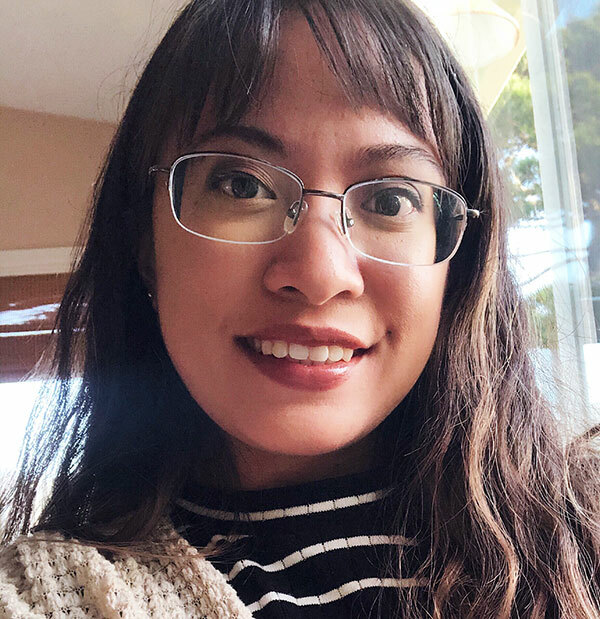 Trista Barrantes (in photo below), an interdisciplinary studies major at Skyline College, has participated in the Kababayan learning community and plans to pursue her bachelor’s degree in environmental studies with a concentration in sustainability and social justice. She had a life-altering experience in the fourth grade while on an outdoor education overnight field trip to SF’s Fort Funston; she writes that “the disparities between the poor, working-class community and those who are better off in terms of accessing the natural world, healthy food options, and the benefits with parks and outdoor recreation, became apparent to me.” Trista plans to continue at Skyline College in the fall. AFT is delighted to honor Trista’s and John’s accomplishments with this year’s AFT Scholarship. The McDonough family and AFT 1493 are delighted to announce this year’s Joe McDonough AFT Social Justice Scholarship awardee: Deborah Armstrong (in photo below). Deborah is a re-entry student and will attend Cañada College. 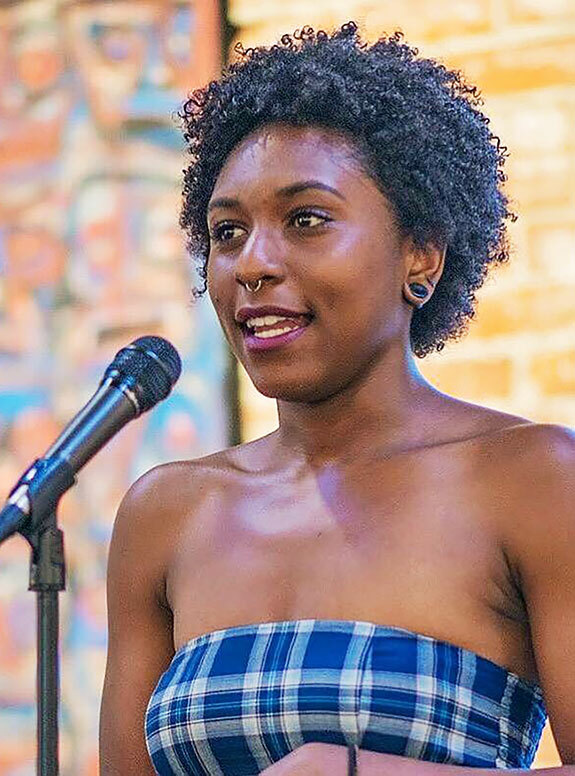 As a believer in art as a vehicle for change, Deb began traveling with a poetry collective SAYS (Sacramento Area Youth Speaks). She then went on to work with a social justice organization in Stockton, Fathers and Families of San Joaquin. She organized a concert #SchoolsNotPrisons, and later facilitated a School to Prison Pipeline workshop at an ACLU conference. As a young, African American mother of a 2-month old, Deborah is excited to re-enter college. She is a dedicated and aware young woman with lots of promise. We wish you the best and great success, Deborah. I’m a classic case of a skeptical conference goer—quick to roll my eyes and snark it up at the first whiff of vapid buzzwords, generic workshop titles and self-congratulating models of best practices. Luckily, the CFT convention, held in Costa Mesa (Orange County) from March 23-25, was anything but the stereotype of a conference or convention. The focus is on faculty and teachers. The agenda largely consists of bare-bone essentials. The tone is a refreshing mix of brass tacks decision-making and something akin to fueling up on inspiration so that we persevere through the many battles sometimes associated with working in public education. While so much happened at the CFT Convention this year, I’d like to highlight just a few moments and take-aways from the weekend. In one of the more contentious votes of the Convention, the general membership voted to support changing the workload cap of part-time college faculty in the state Education Code —which currently restricts adjunct faculty to working a maximum of 67% FTE in any one district — to allow contingent faculty to work up to 80% (an equivalent of 12 lecture units) in a single district. Many community college adjunct faculty endorsed the CFT’s support for this increase as they saw the 67% threshold as an arbitrary limit on their earning and working potential. However, opponents (many of whom were also community college adjunct faculty) feared that an increase in part-time employment hours would effectively result in the diminishment of full-time employment opportunities. If districts were able to rely on contingent labor to teach more, they would have less incentive to fill full-time vacancies. While the Convention vote changes the CFT’s formal position on the percentage the Union believes that part-time faculty should be allowed to work, it will still take a change of the Education Code for the 80% maximum to become a reality. If there was a central question of the weekend’s convention, it would be How is your local preparing for Janus? Janus v AFSCME is the Supreme Court case whose decision could exempt public employees from paying agency fees if they choose not to join their unions. Refreshingly, the Janus case was not framed so much as an existential threat to the vitality of AFT and other public employee unions (though it certainly has the potential to pose such a threat). Instead, the Janus case was presented as a challenge to make our work, our principles and our voice more relevant and meaningful to faculty and the community at large than it has ever been. While we understand intellectually the benefits of organized labor—unionized workers earn an average of $204 per week more than non-unionized workers and the average return on investment for every $1 of union dues is $6.12 in real wage benefits (https://aflcio.org/what-unions-do), members like those of you reading this have to also understand viscerally why being part of a collective bargaining unit matters to you. That is, how union membership enriches not only your working conditions but the function, quality and efficacy of the institutions we work for. Certainly, if there is any silver lining in as vicious an attack on public service labor as Janus is, it is this opportunity to more meaningfully engage with our full membership in continuing to shape a labor organization that we all want to belong to. 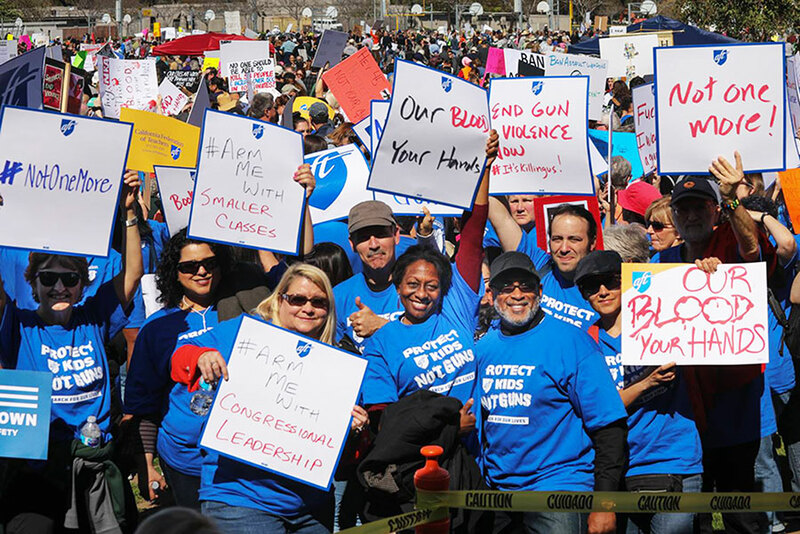 The most remarkable and unforgettable moment of the Convention was our collective attendance at Santa Ana’s March for Our Lives event. 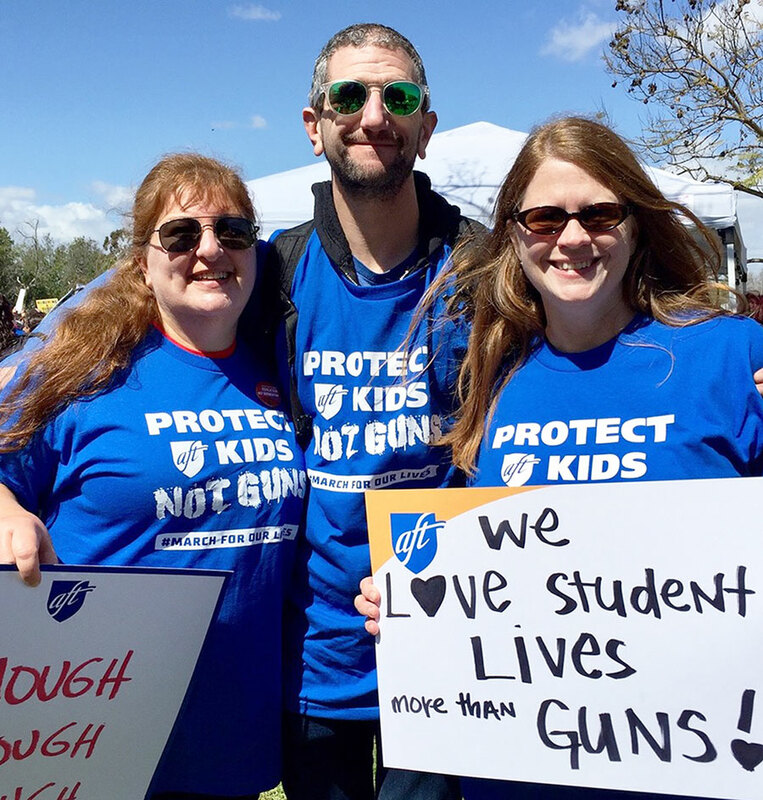 Thousands of educators from across the state descended on Centennial park in central Santa Ana on Saturday to demonstrate and march with students and families to end gun violence on school campuses. The rally was made up primarily of students and was followed by a march around the park. While some were craving more disruption in our demonstration, it was truly gratifying and fulfilling to show teacher solidarity with the student activists and community members in the mile-long march around the park. Another slightly contentious issue voted on by the general membership was to reduce the number of conventions by half, so that CFT meets every other year rather than annually. The main driver of this, of course, was cost. Despite the educational, democratic and—yes—restorative function that the CFT Convention serves for delegates and all union members alike, these benefits could not justify the cost of such a large annual meeting.